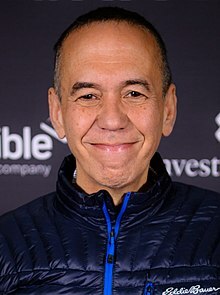 Da Gilbert Gottfried (* 28. Feba 1955 z Brooklyn, Stod New York) ist a amerikanischa Komika und Schauspuia. Da Gottfried is in ana jidischn Famij aufgoxn und definiad si sejm ois Jud. Scho mid 15 is da Gottfried z New York City ois Stand-Up-Comedian aftredn. Ín wenign Joarn is a ois "the comedian's comedian" in ganz New York bekannt worn. Spoda is a aa in Nebnroin in Fuim und Feansegn aftredn und hod Comicfuim synkronisiad. ↑ "About Gilbert". Gilbertgottfried.com. Archived from the original on 2012-10-25. https://web.archive.org/web/20121025175708/http://www.gilbertgottfried.com/about.php. Retrieved on 2013-03-01. De Seitn is zletzt am 10. Meaz 2018 um 22:31 gändert worn.